Built in the early 1960’s, two storey Malthouse Flats are housing association properties that had developed structural problems. 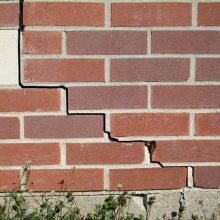 The masonry cracking was identified as being the result of subsidence due to inadequacies in the foundations. The client commissioned a detailed ground investigation and, during excavation works, contractors discovered some cellars belonging to terraced houses that had previously occupied the site. Cost-effective structural repairs were required that would rectify the faults and stabilise the properties, preventing any further subsistence and building damage. Using the client’s ground investigations, Helifix devised a suitable repair scheme using its Dixie micro-piles to overcome the subsidence problems, and the Helibeam system to secure the damaged masonry. These were specified as they could be rapidly and efficiently installed using lightweight equipment externally, therefore causing minimal disruption to residents and a cost effective solution to leave the properties visually, unaltered. As a Helifix approved installer, SUKR were appointed to carry out the works as per the above scheme. Holes were dug adjacent to the foundations and notches cut into the building’s footings. Nine micro-piles were then driven to a depth of 10m in order to reach the load bearing bedrock and achieve the required torque. Adjustable ‘L’ shaped brackets were fitted to the piles and placed under the foundations. They were then jacked up until the specified safe working load was achieved, with the piles then fully supporting the building loads. Approximately 60m of stainless steel HeliBars were bonded into appropriate mortar beds with HeliBond cementicious grout to stitch the cracked brickwork and restore structural integrity. Westby Homes instructed SUKR to reinstate the structural integrity of the masonry at Bollards Court, a three storey masonry building showing historic cracking to the rear left hand corner. Under the requirements of the party wall agreement, Wesby Homes were to ensure that no further damage occurred during the development works of the adjacent site. The cracks were vertically stepped at various locations up the height of the rear left corner of the building, which were believed to be caused by historic settlement of the foundation. The cracking had been monitored over a period of time and results indicated the cracking was not progressive. A combination of Helifix Helibars, HeliBond grout & CemTies were installed as per the design to tie the defective masonry together whilst creating deep masonry beams to distribute the structural loads. As an approved installer we were able to offer a 10 year Helibeam System Approved Installer Guarantee which also falls under the Consumer Protection Association Insurance Backed Guarantee Scheme. Little Salkeld Viaduct, also know as Dodds Mill Viaduct, is to be found in the Eden district of Cumbria, a few miles to the North-East of Penrith. The Viaduct consists of 7 arches, is 60 feet in height, and 134 yards long. As part of Network Rails Asset Management strategy, the London North West route has experienced significant investment, in an effort to enhance, renew and maintain infrastructure. 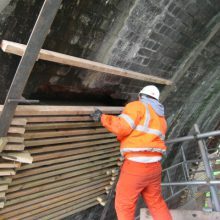 Works to little Salkeld Viaduct were carried out as part of this investment once Network Rail Asset Engineers had highlighted the need for brickwork enhancement works to each of the 7 spandrels forming the viaduct. Specialist UK Restorations were appointed via AMCO Rail to carry out the works as per Network Rail Standard Design Drawings, and as outlined in the remit items of each detailed repair schedule. Due to the scaffold being erected to individual arches in stages and on pre-determined dates, it was paramount that we managed our workloads in line with the agreed programme. As part of the brickwork enhancement remit, re-pointing was carried out to open joints throughout the spandrel walls, with areas of cracking and joint fractures undergoing stitch repairs and re-pointing as per Network Rail Standard Design Drawings NR/CIV/SD/101A, 106A & 107A. The major element of the works consisted of several large areas of brickwork re-casing, as per NR/CIV/SD/101A & 103A. In certain locations spalling up to 190mm deep was evident, and in others the first course of arch rings had dropped noticeably. 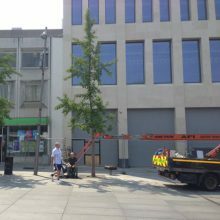 A number of dilapidated Victorian three storey buildings were to be demolished to make way for some newly constructed retail units. 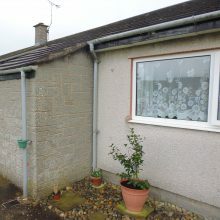 However, a full laser survey identified that the adjacent concrete frame building, constructed in the 1970’s, has been built into the gable end wall of the properties to be demolished, in effect creating a solid party wall. The survey and site investigations showed that the gable end comprised two adjacent 9″ walls, now forming one wall. This double end wall of the properties had to be retained and a cost-effective and reliable means was required to tie it together and then secure it to the adjacent property. As an approved installer of all Helifix products, SUKR were appointed to install a Helifix designed structural solution, which consisted of using grouted CemTies and SockFix grouted sock anchors. Approximately 1,000 8mm stainless steel CemTies of varying lengths, bonded with Helibond cementitious grout, were installed in a 450mm x 450mm staggered formation to tie the two adjacent 9″ gable end walls. Some 60 SockFix grouted anchors, 1,500mm long were then installed at 600mm horizontal centres into the hollow concrete floor slab of the adjacent building at each floor level. These secured the retained gable wall to the main structure of the adjacent building. To keep disruption to a minimum all works were carried out by Specialist UK Restorations Ltd at night. Ensuring the day time trade could continue as normal throughout the entirety of the works. The Helifix ties and anchors provided a fast, efficient and economical solution and, with the wall fully secured, Wates Construction were able to proceed with the demolition without any major contract delays. Situated in Liverpool, Tower Gardens is a new development by Barratt Homes of three and four bedroom homes catering for first time buyers and growing families alike. One plot was suffering from movement due to different foundations and required remedial works to allow for this ongoing movement. SUKR were instructed by Barrett Homes to create four vertical movement joints and install the Helibeam system at pre-determined locations. The movement joints were created on the rear of the building and to the front elevation around the central doorway using a combination of Helifix SlipTies and Helifix DryFix Ties. All works were completed in four days and in keeping with the local area we concealed the repairs using a variety of coloured facing brick including red and buff with blue and red detail, pointed up in a matching mortar. A trial pit is an excavation of ground in order to study or sample the composition and structure of the subsurface. Trial pits are usually between 1 and 4 metres deep, and are dug either by hand or using a mechanical digger. 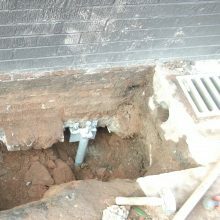 We undertook a series of trial pits on behalf of Flintshire County Council to expose the size and depth of the existing foundation to a series of store cupboard annexes at a number of residences, all of which were suffering from subsidence. The Surveys, carried out in conjunction with Salem Myer Simpson, confirmed that Helical micro piles would provide the required structural support to the foundations and alleviate the current concerns/issues. Based upon the results of the survey SUKR & Helifix were then able to provide a full design and specification for Flintshire County Council. 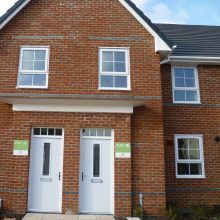 As part of an on-going maintenance programme to Liverpool Mutual Homes housing stock, we were employed by Housing Maintenance Solutions to stabilise 18no. brick bin store annexes on various properties within the Anfield area of Liverpool. The existing raft foundations upon which the brick bin store annexes had been built were inadequate and had subsequently failed. Resultant rotational movement was evident from large vertical cracks between the main structure and annex had been breached. 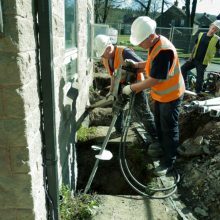 Helifix Micro-piles, of which we are an approved installer, were specified by the appointed Structural Engineers as a proven and cost effective alternative to other stabilisation methods which require extensive excavations. Each bin store was stabilised by installing four Helifix Micro-piles, with a design load of 100kN for each pile. Excavations were undertaken to the foot of the foundations at the predetermined locations, with each pile then being ‘screwed’ deep into stable subsoil using lightweight hand held equipment until the required torque was achieved. Adjustable ‘L’ shaped brackets were fitted to the piles and under the foundations and jacked up to achieve the correct loading, thereby transferring the weight of the building to the piles. Installation was carried out with all tenants in-situ, with each store being completed in under two days, With the piles preventing further settlement soft movement joints were formed at the junction of the bin store and main property. As an approved installer of Helifix Ltd, Specialist UK Restorations were appointed as Principal Contractor by Cobalt Housing on a parapet wall stabilisation scheme to block of housing which forms part of their affordable housing stock. 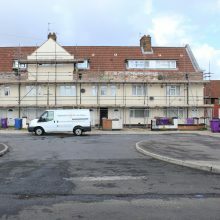 The block of properties in question were suffering from structurally significant leaning of parapet walls due to the lack of adequate lateral restraint between the external walls and floor joists, beams & partitions. Defects of this nature are common in properties built pre 1914, in end of terrace or semi-detached three storey houses. The Helifix designed restraint system formed the majority of the works, and included installation of Helifix BowTies into first floor ceiling joint ends. Bed joint reinforcement (using twin chord 6mm HeliBars) the full length of each parapet including a 500mm return to the gable. Removal of copings to allow access for vertically drilling and installing Helifix CemTies into the sound masonry of the main wall ensuring embedment to a minimum of 225mm. Once all structural works were complete we also undertook the decorative elements to include full parapet gutter relining, external sand/cement rendering and application of an approved masonry paint to the entire front elevation. Successful completion of the works included meeting the agreed programme, with any tenants remaining in-situ throughout, and provision of a 10 year Helibeam System Approved Installer Guarantee. The present building of Westborough Methodist Church dates from 1862, and is a Grade II listed building in Scarborough with large ashlar front and a Tetrastyle Corinthian portico with heavy entablature and pediment.Certain stone blocks within the architrave of the entablature had shown considerable signs of movement over the years, due to differential/thermal movement and corrosion of the mild steel fixings. 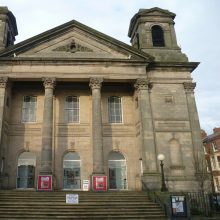 The movement was such that it was deemed a potential H&S risk to those in the immediate vicinity of the portico.SUKR were appointed to realign and structurally stabilise the stone architrave using ten Helifix Sock Anchors each 1.5M in length. The holes to accommodate the anchors were diamond core drilled in the positions indicated on the design. The anchors were subsequently installed ensuring a minimum of 0.5m embedment into the adjacent masonry. Grout was then mechanically pumped slowly onto the sock, expanding the sock to fill the hole. Fluid permeates through the sock to provide a bond with the substrate while a solid aggregate bar/grout composite is formed in the sock.Once the structural integrity of the masonry was restored we finished the drill holes with a matching restoration mortar, fully concealing the repairs. Additional pointing works were also undertaken using a suitable lime based pointing mortar, as required on buildings of a historical nature. 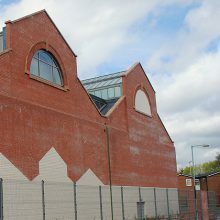 Manchester College had on its campus a Grade I Listed building which consisted of a disused Victorian swimming pool. The college wanted to develop the building while retaining the listed structure and many of its features. Engineers came up with the idea of tying the old structure into a mainly new built outer leaf. SUKR were appointed as specialist Helifix Approved Installer to carry out a Remedial Wall Tie survey and propose a solution to achieve this. SUKR where quickly appointed to start works based on their proposal which included the installation of Helifix CemTies and HeliBars. The white glazed brickwork in the picture above is the old listed structure whilst surrounding it the new. A great example of how a disused listed building can be saved, brought back into use and benefit from new building technologies.